Ignorance is a dangerous thing. Ignorance coupled with superstitions is ruinous, as is evidenced by the detrimental state of affairs when it comes to menstruation in the country. Menstruation is a controversial topic in India. Most consider it too taboo a topic to be discussed. As a result 87% girls don’t know the importance of menstruation as a biological process in their bodies. In rural areas and even among semi-literate people, the act of menstruation is considered impure. Girls on their period are forbidden to enter temples, touch vessels in which food are cooked and are even isolated from other family members lest they pollute the environment. In August, last year a school girl in Tamil Nadu committed suicide after she was publicly humiliated by the teacher in front of her class consisting of both boys and girls because she had stained her skirt. (1) In some villages superstitious beliefs hold sway; such as if a girl goes out after dark during menstruation she will go blind and using a sanitary pad may render the girl unable to marry. Amongst all this period shaming, Arunachalam Muruganantham’s crusade against these malpractices started unwittingly. Born to a poor family of handloom weavers in Coimbatore, Tamil Nadu, Muruganantham had to drop out of school at the age of 14 after his father’s death. He took up various jobs as a machine-tool operator, farm labourer and welder to make ends meet. He got married to his wife, Shanthi and like all newlyweds, was looking to impress her. One day he saw her hiding something behind her back. When he asked her about it she was reluctant to reveal what she was hiding and then he spotted a dirty rag stained with blood in her hands. Putting two and two together he realized that she was resorting to unhygienic methods to cope with her periods. “I will be honest”, says Muruganantham. “I would not even use it to clean my scooter.” When asked why she didn’t use sanitary pads, she replied that they were so expensive that if she had to buy sanitary pads for herself they would have to cut down on their milk budget. Muruganantham went to town to buy her a packet of sanitary pads as a gift. He noticed the cloak and dagger way in which the shopkeeper surreptitiously wrapped the packet in a black cover and sneaked it to him. He realized that less than 10g of cotton which cost 10 paise then was being sold for way higher prices and took it upon himself to create a less costly alternative. And thus, Muruganantham’s quest began which would soon consume him and most of his time and energy. During his ordeal to recruit volunteers he found that only a meagre 12% in India used sanitary pads. The situation was even more dismal in rural areas. Women resorted to unhygienic and archaic practices like using ashes, dry leaves, old rags, sand and sawdust to soak up their menstrual blood. These can lead to fatal infections. One in twenty women had access to hygienic menstrual products and these were pricey imports available in cities. Girls miss five days of school in a month owing to inadequate menstrual products and lack of toilets in schools. Around 23% of girls have to drop out of school owing to menstruation and miss out on an education. (3) This bleak scenario bolstered Muruganantham’s determination; he had to do this not just for his wife, but for most of the women in the country. He finally succeeded in getting 20 college girls to give him feedback but when he came back to collect the feedback forms he found three girls filling them all in. Muruganantham had to fall back on his own resources for results; he decided to use a pad himself and thus was born India’s Menstrual Man. A soft bell would chime at Muruganantham’s gate to indicate that his butcher friend was cutting a goat. Muruganantham would collect the goat’s blood, mix it with an additive to prevent clotting and fill a football bladder with it. The bladder was connected to a tube which led to his prototype pad to check absorption. The bladder was placed inside his clothes and Muruganantham would carry on with his daily activities like cycling, running and walking pumping blood out sporadically to mimic menstrual bleeding patterns. This led to its own series of problems. His clothes would get stained with blood and a foul smell emanated from him wherever he went. The football bladder split one day to drench his clothes in blood and in a conservative village like Muruga’s, people talked about his bizarre ways. They thought he had gone mad. While washing his blood stained clothes at the common well in the village, people thought he had a sexual disease or he was just perverted. His quest for volunteers gave rise to rumours about him having affairs. His mother up and left one day when she came upon him studying used pads to figure out how they worked. The villagers were convinced he was possessed and wanted to chain him upside down to a tree in order to exorcise the demons from within him. (4) Upset by his fixation on his project and the badmouthing of her neighbors, Shanthi left him to go live with her mother. Friends would cross the road whenever they saw him to avoid talking to him. He was ostracized by the village and left isolated. His research continued. He was puzzled by what the pricey pads produced by huge industrial stalwarts were made of, apart from cotton. With the help of a professor he wrote to some companies to ask what these pads were made of when he got the answer. Cellulose, from the bark of a tree was used to make these pads, but the machines required to manufacture the pads cost over 500,000 dollars. Muruga was set on paving the way for locally produced, cheaper pads. With sheer ingenuity, he created his own simplistic machine which breaks down cellulose, shapes the cotton into compact rectangular pads which are wrapped in non-woven cloth and then sanitized in a UV unit. After four and a half years, Muruganantham tasted success; he had created a low cost sanitary pad which would help millions of women. He went to IIT Madras in 2006 with his model and they in turn registered his invention for a national innovation award. Muruganatham’s simple model beat 943 entries to come first. Muruganantham received the award from the then president Pratibha Patil. Slowly the unraveled threads of his life started knitting themselves back. After five years, Shanthi called him. She had seen his success in magazines and on TV. Slowly, Muruganatham’s mother and villagers came around too after seeing what he had created. Muruganatham could have made mounds of money with his invention but he chose to give his machine to women self-help groups, NGOs and schools instead. He’s taken his machine to underdeveloped regions in Bihar, Madhya Pradesh, Rajasthan and Uttar Pradesh to provide women with these sanitary pads. Women in Rajasthan walk miles to fetch water for their homes and can’t do so when they’re menstruating. Balki’s upcoming movie Pad Man is based on this incredible man’s journey. Both Muruganantham and Akshay Kumar, who plays the social entrepreneur in the movie, hope to bring about vast changes in set mindsets among the masses by this movie. He was left a little surprised however, when the Indian government announced subsidized sanitary pads for poor people and didn’t not rope him in into the venture. Nevertheless, Muruganantham plans to spread his product globally. 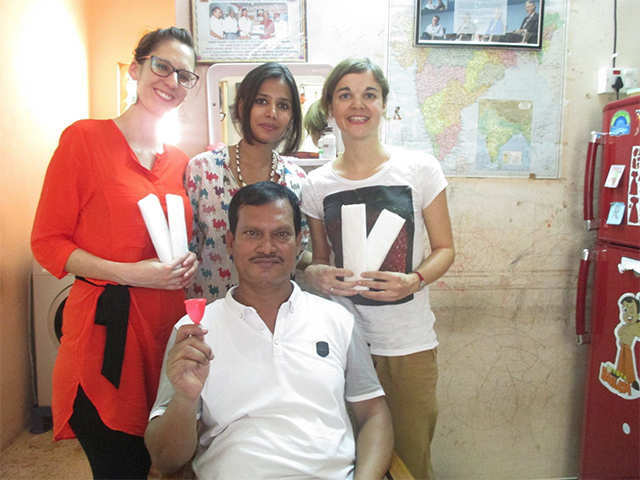 His vision is, however, to make India a 100% sanitary napkin using country. And as India’s Menstrual Man, he might well succeed. 1 Geetanjali Taragi. (August, 2017) Young Girl In Tamil Nadu Commits Suicide After She’s Period-Shamed By Her Teacher. ScoopWhoop. 2 Vibeke Vinema (March, 2014) The Indian Sanitary Pad Revolutionary. BBC. 3 Kounteya Sinha (January, 2011) 70% Can’t Afford Sanitary napkins, Reveals Study. Times of India. 4 Vibeke Vinema (March, 2014) The Indian Sanitary Pad Revolutionary. BBC. 5 Vibeke Vinema (March, 2014) The Indian Sanitary Pad Revolutionary. BBC. 6 Vibeke Vinema (March, 2014) The Indian Sanitary Pad Revolutionary. BBC.